Introduced in mid-2009, the '10 Mustang features a complete redesign of the body that is sure to catch a lot of attention after the success of its predecessor which reigned from '05-'09. The new model Mustang features less harsh styling with a sportier look that remains very distinguished, especially because of the front fascia. 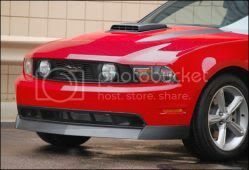 Compliment your Mustang's aggressive front end with the CDC Chin Spoiler. This component blends with the natural lines of the lower fascia, creating an intimidating appearance that retains a fresh, factory look. This chin spoiler also brings the Mustang closer to the road which greatly improves the vehicle's stance. - Molded (textured black) in OE quality TPO material, this is truly the next generation of chin spoilers. - Optional Brake Duct cooling kit - which provides immediate air flow to your brakes and rotors to help keep them cool in all driving conditions. - Optional Fog Lamp Kit - If you decide to replace your front grille to delete your factory fog lamp set up or simply wish to add a secondary set of fog lamps, this chin spoiler is perfect for you!